Plenty Of Fish made 2017 the year of getting back to basics. While other dating services introduced features seemingly designed to require less communication (looking at you, Tinder Reactions), POF has been all about the chitchat. First, the company sponsored Conversation Nation, which it claims is the largest study ever conducted on the importance of conversation in the search for love. Inspired by what it learned from the survey, POF went on to update its iOS and Android apps with a new feature called Spark designed to help singles break the ice easily. "With more conversations than any other dating app, Plenty of Fish is focused on bringing conversation back to singles," Hesam Hosseini, POF’s CEO, said at the time. "In the short time we've been testing Spark, we've seen a 15 percent increase in conversations. Given our scale, this can result in an increase of hundreds of thousands of conversations happening every day on the app, leading to more dates and more relationships – and it is just our first step to bring the art of conversation back to dating." Now it appears Spark is just one part of a larger strategy to refresh Plenty of Fish and put conversation in the spotlight. 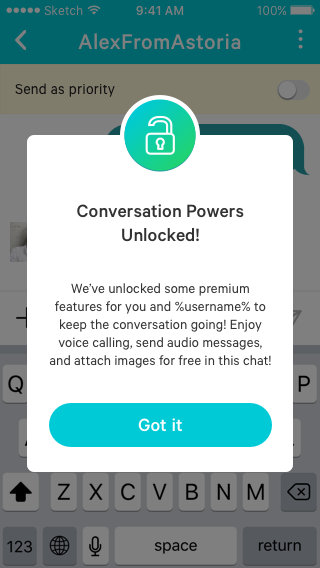 The company plans to launch an entire suite of new features, reports TechCrunch, called “Conversation Powers.” The updates include voice messaging, video calling, and the ability to share photos in chats. Later on, POF will also launch GIF sharing in conversations and the ability to add illustrations to photos, like the doodles and stickers popularized by Snapchat. One interesting twist is Plenty of Fish will trigger your “Conversation Powers” after you’ve chatted with a match for a period of time, you will not be able to use your powers until then. While similar features have become commonplace on social media applications, Hosseini says the dating industry has yet to fully embrace them. The reasons for the updates go beyond keeping up with the latest trends. 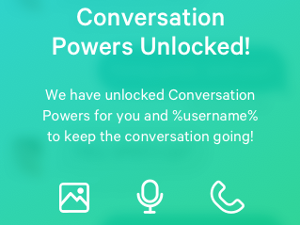 The Conversation Powers offer users more ways to connect and greater opportunity to personalize their interactions. POF’s demographic tends to skew older; older singles prefer voice over texting, but not everyone is comfortable with sharing their phone number with a stranger. POF users tend to be in the 30 to 40 age range. That’s where features like voice calling, which allows members to call each other from within the app, and voice messaging come in. On a macro level, POF also hopes its new-found focus on conversation will help differentiate it from Tinder and other competitors. The Plenty of Fish service is the second largest dating service in Match Group's portfolio (behind Tinder). They now have 150 million registered users worldwide. It’s also the second largest in terms of monthly users. POF also claims that 2.5 million conversations taking place on its service (website and apps) daily. This is the most conversations when compared with other dating apps and websites. The new messaging, calling, and photo features are available now on iOS and Android. Look for GIF integration and illustrations to arrive sometime in 2018. For more on this dating service you can read our POF review.